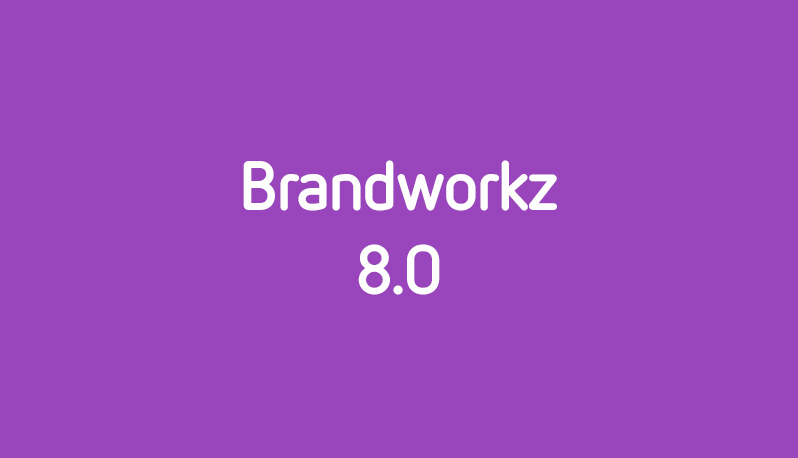 Brandworkz, the brand asset management and digital asset management software company today announced that it has launched software version 8.0. This is a major release including a completely overhauled digital asset management (DAM) module with a brand new, desktop-like user interface. “We are very excited to share our biggest release to date with our clients. The aim is to enhance user experience in line with the first of the Brandworkz company values ‘striving for simplicity’. The redesigned DAM module and new user interface allow client users to interact with their assets more intuitively and more quickly. Users will notice a number of improvements in the look and feel and in how they perform tasks.” says Hari Walters, Head of Product at Brandworkz. The user interface is cleaner, images and folders are shown as larger thumbnails and new icons have been introduced based on those we are used to seeing on our desktops. Actions like right-clicking to reveal menus, multi-select, drag and drop, opening multiple tabs in the same view and quick sharing are just some of the changes to the front end of the Brandworkz platform. In order to keep the Brandworkz interface as simple as possible, the Actions in the toolbar only show up when you can actually use them. For example, if you click on one or more assets, the actions you can perform will appear in the toolbar such as sharing, add to album, edit metadata, move and delete (dependent on your permission levels). If you have not selected any assets, only the standard Actions, download and upload will show as available. The side panel enables you to perform quick actions, such as downloading, sharing and relating. It also allows you to quickly add assets to your existing albums and make new albums. In order to keep the Brandworkz software version 8.0 interface as clean and simple as possible, the side panel is hidden behind a tab on the right of your screen but appears when moused-over, so it is available in an instant, but is hidden when not needed. You can drag assets into the side panel from any folder in your Brandworkz platform. We’ve made it easier and faster to save a collection of assets in your albums and share them with others. Not only can you drag multiple assets or folders into an album at once, but you can now view assets within an album with the new full screen preview, and with all the great new features from the new UI. We’ve made sending albums better too as your recipient gets a branded email. This new feature hugely speeds up the process of finding, selecting, moving and sharing assets. If you need to open multiple folders at once, you can now do this by right clicking on a folder and selecting ‘open in new tab’. The folders will show as tabs along your Action bar allowing you to quickly jump to areas that you access frequently. This is particularly useful if you need to move assets between folders, as you can just drag and drop them into the required folder tab, or if you are selecting multiple assets from multiple folders to drag into an album. Search is one of the most important features in a digital asset management platform, and our new Folder Search enables you find the folders you need, fast, with the search filter. This is particularly useful for people with large numbers of folders who want to find a specific one instantly. This improved feature allows you to see all the metadata associated with your asset as well as being able to view it in a large preview window, giving you more information at your fingertips. We are all used to using keyboard shortcuts on our desktops. Now you can use the same shortcuts in Brandworkz to organise and manage your assets, making your experience of using the platform all the more intuitive. We are used to right-clicking on our desktops, so now you can do the same in Brandworkz. Right click on any asset or folder to see and select the available Actions associated with it. The same is true for drag and drop. Use your mouse or touch screen device to quickly drag assets into folders or albums. This is another improvement to user experience. Files from your desktop can be dragged into a folder for upload, without having to first click the upload button. You can also view the progress of your upload whilst browsing to other folders. Want to view your assets as a list? Prefer to see them as large thumbnails? With the improved sort feature, you can view your assets the way you like, with lots more filter, sort and grid/list options.